The following Electrostatic Loudspeaker Kits are supplied for home use only and may not be used for commercial gain unless authorised by ER Audio in writing. All photographs, drawings and text contained in the kits are subject to copyright laws and may not be reproduced or copied in part or in full without written permission from E R Audio. Acceptance of any kit implies acceptance of these terms. Some design aspects of the ESL loudspeaker described below are subject to patents pending for Immersion Technology International PLC. The Acorn has been developed with the knowledge and experience gained over many years with our other successful electrostatic speakers, the ESL III, ESL IIIb, ESL 4 and ELS 5. While the Acorn ESL has been designed primarily for the home constructor, there have been no compromises made to performance or sound quality to achieve this aim. Indeed, the performance of the Acorn is up amongst the very best of the commercially available electrostatic loudspeakers, regardless of cost. As well as being a top shelf audiophile loudspeaker, part of the design requirement was for the Acorn to become part of a high-end home theatre system. It is extremely important that effects speakers sound “the same” as the front speakers to avoid Arnie turning into Donald Duck when he exits stage left!! To this end it is considered essential that all speakers used in a high-end theatre system, possibly with the exception of a sub-woofer, use the same electrostatic principle for operation. As the Acorn is a modular design, it is a simple matter to use 2 of the panels that make up one Acorn speaker for the rear effects. This means that exactly the same tonality, transient response and low-level detail retrieval are retained by the effects speakers. A curved ESL speaker has been designed for the centre front position, which again has the same tonal signature as the front and rear effects speakers. This serves to pinpoint central images for those sitting off axis to the front main speakers. While the Acorns do have good bass response in their own right, a sub-woofer is still necessary for the very low frequencies engineered into most movies to enhance the special effects. It now becomes clear why these speakers are called the Acorn; “from small Acorns large Oak trees grow”!! The final requirement was for the design to be easily constructed at home with minimal equipment and no special jigs. This design goal has been met. There are three electrically separate stators laid out in an asymmetric, mirror-imaged array on a single flat panel. 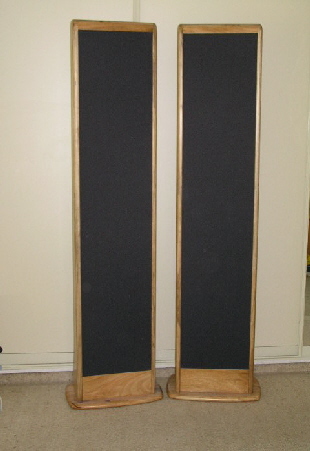 The narrow treble section is offset to the inside edge of the speakers forming a distinct “Left” and “Right” handed loudspeaker. The mid-range section is placed more or less centrally followed by the bass section on the outside. The bass panels have an array of node points scaled to distribute panel resonances, which eliminates the “one note bass” often encountered. These node points also reduce anti-node formation at certain frequencies, which result in “dead” or redundant sections of diaphragm. The relevant frequencies are fed to the Bass, Mid-Range and Treble panels by the individual transformer used for that section. As a narrow strip is emitting the high frequencies, the sweet spot is reasonably wide with very good off axis performance. When correctly positioned in the room, the stereo image never collapses into one speaker, even when listening greatly off axis. Given a good recording and equipment, the soundstage presented is three-dimensional with distinct separation between instruments. Width extending past the outer boundaries of the speakers is apparent on those recordings in which this effect has been engineered. Frequency response is extended and flat and, as the design is essentially crossover-less, there are no signal modifying (destroying) capacitors or inductors to shape it to be acceptable. As with the ESL III, it was considered essential to make this speaker a zero shunt capacitance design. As an example, ESL panels, which have air gap spacers that are simply glued onto a conductive stator, may be simple to build but there is a serious trade-off. The area of grid that has the spacer covering it is non productive - it cannot drive the diaphragm, BUT the amplifier is still driving the capacitance it presents. This means that on one speaker the size of the Acorn, there would be over 2750 square centimetres of grid doing no work at all, but still presenting a load to the amplifier. To get this into context, this represents a “dead” panel 1 metre long by 27.5 cm wide. This means that the speaker has to be significantly larger to achieve the same output. This increases the capacitance, which in turn requires a more powerful amplifier to drive it. The method adopted in the Acorn is for the stator to be supported away from the air gap spacers on a CNC machined non-conductive plastic panel. This means that all of the conductive portion of the stator is contributing to the output. The plastic support structure has been CNC machined from a light but stiff plastic and allows for the bass, mid-range and treble sections to be set at the optimum depth very accurately. Close tolerances are essential in any ESL design as variation in depth can lead to distortion components and diaphragm instability. 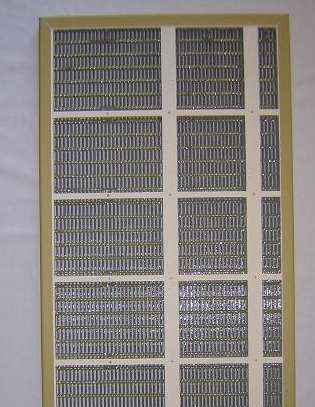 As the stators are recessed into the support structure, a single diaphragm can be used across the surface of the panel. The spacers that remain between the stators create the three discrete sections. Splitting the panel into 3 separate sections has a great benefit. Imagine a single panel reproducing say 40 Hz and 10kHz at the same time, the diaphragm has to undergo large excursion to produce 40Hz but at the same time it is trying to reproduce 10kHz. Now, the only time the diaphragm will reproduce 10kHz accurately is when it is in the exact centre between the stators, the 10kHz waveform will be asymmetric at all other times, this effect is intermodulation distortion (IMD). IMD is present in all transducers but steps can be taken to minimise it by having one section dedicated to reproducing low frequencies, another section for the mid-range and another for high frequencies. This way each section does not have to have large excursion for low frequencies mixed with small excursion for high frequencies, this results in low IMD. The load presented by the completed speaker to the amplifier is quite benign with the lowest impedance of 3 ohms occurring at around 15kHz. The impedance for the audio spectrum below this and up to 20kHz is typically >4Ohms. As a support structure was to be used to reduce shunt capacitance, this gave the opportunity to use the thinnest but stiff PCB material available for the stators. The gauge of board that is used in the bass and mid-range sections is 1.5mm thick. The treble section has 1mm thick material. Whilst using stators of thicker material does not cause high frequency roll off to any serious degree (that is until they get to around >2mm thick), they are unable to retrieve low-level detail completely. This is due to the air mass that is contained in the individual holes. Effectively the holes form a small resonator, which destroys low-level information. The frequencies that this occurs are linked to the ratio of the thickness of the material versus the diameter of the hole and are too complex to thoroughly explore here (even if I understood it fully). However, it is our experience that thinner stators simply sound better so we adopted this approach. The bass and mid-range stators have clearance holes punched down the central vertical axis to allow small plastic posts, which are machined into the plastic panel, to pass through. These posts are used to firmly clamp the panel together down the central axis of the bass and mid-range sections. The panel is also clamped with plastic through bolts down the dividing sections between the treble and mid-range sections. This, combined with the channel section that clamps the outer edge of the panel, makes for a very stiff structure with accurate stator to diaphragm spacing over its entire area. The stators are insulated with a double layer of a high dielectric strength UV cure coating, the copper is etched away from the edge of the slots or holes so that the insulation encapsulates the conductive copper. This very effectively insulates them. PCB material is acoustically inert so requires no damping to be applied. This makes it easier for the DIY’er. We are now using a thinner “faster” material than the previous film. This material is made by Dupont and has been proven to give exceptional sonic performance as well as being tough and durable. This film is 3.5 microns thick. The use of this film results in amazingly fast transient response and low level detail retrieval. When auditioning this material in the Acorns (and ESL III’s for that matter), most listeners will comment on the extra detail that they are hearing from familiar recordings, which they have not heard before from their own systems. This is the area that causes most home constructors some concern. Over the past 20 years we have developed a technique to tension the film that does not rely on time wasting tensioning frames etc. Our method is simple and quick and gives reliable, repeatable results. This is not a heat shrink method, which can have some unpredictable results. All the builder needs to do is provide a smooth flat surface large enough to place the 930 x 450 mm Acorn panel with about 100 mm clearance all around. The tensioning gauge and all materials required to successfully and easily apply the diaphragms are provided in the Acorn kit. Tensioning and applying the diaphragm to one panel takes about 30 minutes. If this scares you we are now able to offer a diaphragm installation service. Due to demand from our customers, we have developed a low mass, clear conductive coating that replaces our Opaque material. This coating is not an ionic solution such as used in static dissipants and does not rely upon ambient moisture to make it conductive. It is humidity independent meaning that the weather will not affect its performance. This coating has been extensively tested in both high humidity areas and the very dry areas of the Australian desert regions with excellent results. The surface resistivity is in excess of 1000 ohms per square when fully cured. This means that charge migration will not occur, even at the lowest frequencies of interest. This gives good bass performance and reliability without sacrificing sensitivity. As the Acorn ESL has panels with different air gaps between the stators and diaphragm, two polarising voltages are used to maintain the correct sensitivity for each section. The bass section has the larger gap therefore requires a higher polarising voltage. The Acorn has a single sheet of film covering bass, mid-range and treble sections, fortunately, the coating we use can be easily applied where needed so it is a simple matter to leave a gap in the coating to allow the coating over the bass section to be electrically isolated from the coating over the treble / mid-range section. Two electrically separate copper high voltage “charge rings” that run around the perimeter of the separate stators provide charge to the two separate areas of conductive coating. These copper charge rings are applied to the panel half that does not carry the diaphragm. When the two halves are brought together, the copper foil contacts the conductive coating and transfers charge onto it. New EHT supplies have been developed for the Acorn. This design uses a small switch-mode inverter, which drives a voltage multiplier stage. The supply has a tapped output, which provides the two polarising voltages required for the Acorn. The EHT supply is driven by an adjustable regulated dc supply, which is powered by a standard 15 volts dc Plug Pak. The EHT supply is normally housed in the base of each loudspeaker. This means that there are no mains potential or high voltage wires leading to the loudspeakers, just 15 volts dc and the normal speaker cables from your amplifier. As the regulator drives both speakers it is a simple matter to optimise operating voltages by the turn of a single trim pot. The regulator eliminates any variations in polarising voltage due to mains voltage fluctuation. The audio transformers we use are another proprietary design of 1:100 (Treble / Mid) and 1:150 (bass section) turns ratio. These are a multi section, interleaved design with a power handling capability of over 100 watts. Low distortion and faithful reproduction of signal sources such as square waves was a priority. As these were specifically designed for electrostatic loudspeakers with very high voltages envisaged, a second priority was placed on internal insulation and high voltage enamel for the winding wire. The selected turns ratio gives sufficient drive voltage, even from lower output amplifiers, without putting too high a demand on current. However, amplifiers with good current capabilities are necessary for high sound pressure level listening. 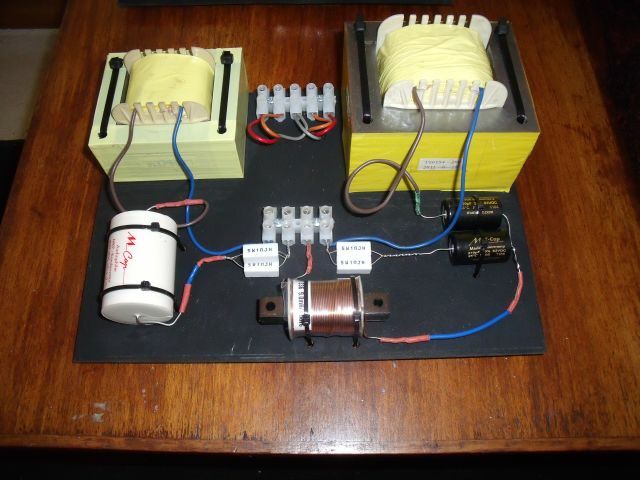 The triple transformer system requires that frequencies are divided and delivered to the appropriate transformers, which are then connected to the individual sections of the panel. The crossover can have profound effects on the sound quality so we have decided to use high quality Mundorf capacitors throughout. While more expensive “audiophile” capacitors exist and could be used as an option, we have found that the Mundorf caps synergise very well indeed with the remainder of the components in the signal path. 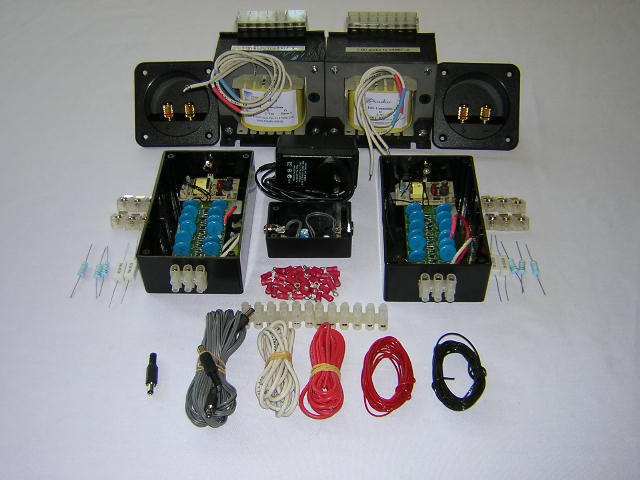 The topology of the crossover allows a single amplifier to be used for both transformers, or with the removal of the gold plated links on the input terminals, the system can be bi-wired or bi-amplified. Indeed, the system can be tri-amped if desired. This gives a perfect opportunity to try out amplifier combinations such as gutsy solid state for the bottom end (class D??) and delicate detailed tube amplification for the mid / treble. Now supplied with Printed Circuit Board Stators, three Input Transformers a new Crossover Printed Circuit board with panel protection and High Quality Components. The Acorn ESL is available as a full DIY kit requiring the stators to be bonded into the support structure and all electronics assembled onto their circuit boards or as a partially assembled unit where the stators are pre-glued into the support panels and the electronics are assembled and tested. The ability to Bi or Tri-Amplify using the existing passive crossover. An active crossover / DSP unit may be used in place of the passive unit, however, we recommend the passive unit is used at first to create a sonic benchmark. The crossover uses high quality Mundorf capacitors and non-inductive resistors throughout. Please note enclosures are not supplied in this kit, however, plans are provided in the construction manual. Full assembly support is available via email or telephone. What do you get in the box??? The picture above shows the Acorn ESL kit in its packing crate. The photo’s below show the contents in finer detail. 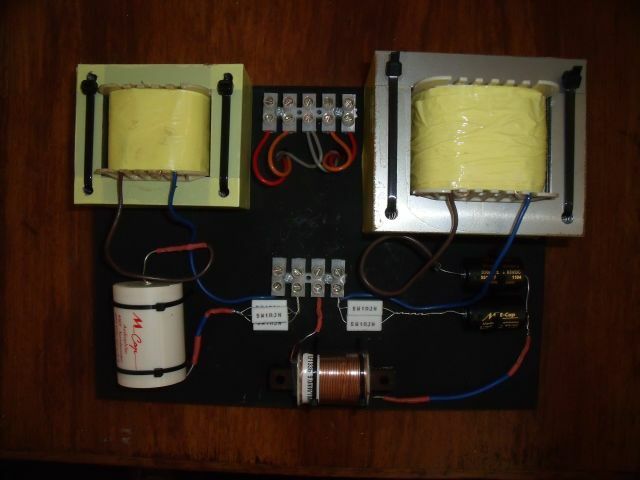 The photo above shows the audio transformers (single transformer version), speaker cable connection plates, assembled EHT supplies, assembled voltage regulator, plug pak,connection terminals etc cable and balance resistors. edge channel and a roll of diaphragm film. 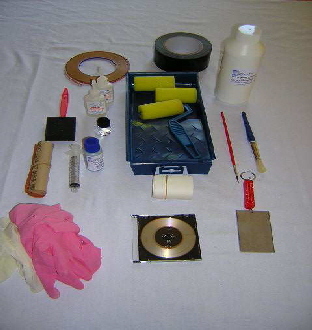 Above - Construction materials consisting of adhesives, rollers, applicator and brushes, tension gauge, rubber gloves etc, plus a roll of copper foil tape for the EHT charge ring and a construction manual on CD Rom. How do you improve an already great loudspeaker? The Acorn was originally introduced with a single transformer driving the 3 individual sections of the panels through a simple filter to direct the correct frequencies to the correct section. Stators were made from custom punched steel, insulation was by powdercoating. We then introduced a dual transformer design with a crossover to separate the low frequencies and direct them to the dedicated bass section, the mid and high frequencies were dealt with by a separate transformer with the mid range section having high frequencies filtered from them using high voltage resistors. This enabled us to use a higher turns ratio bass transformer to compensate for front to rear cancellation effects and to more effectively remove low frequency signals from the mid treble sections. The effect was not subtle. The bass response and extension was greatly improved with a fast clean and sweet mid / treble. So what have we done now? The first and most import modification is to the stators. 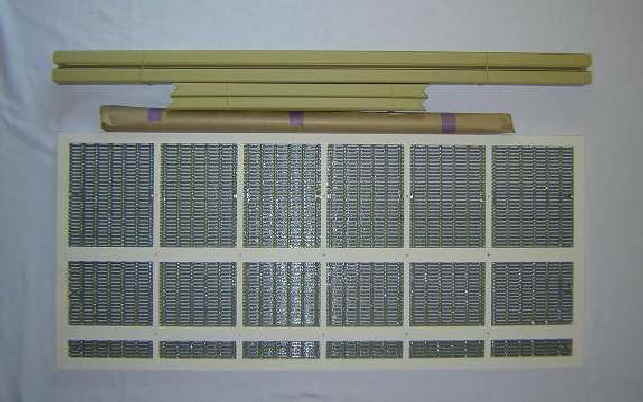 We have changed the punched steel stators to custom made slotted printed circuit board material. This has several benefits over punched steel. First it is very uniform and flat. Punched steel tends to buckle slightly during the punching process so does not always present a perfectly flat face to the diaphragm, this creates differences in the distance between the diaphragm and the stator, which can cause a small but audible distortion. Second the PCB material is acoustically inert so it does not need damping with polyurethane to prevent ringing. Third the conductive layer is on the inside only making the speaker much safer from prying fingers. Fourth, it is difficult to properly powder coat (insulate) perforated steel because the electrically charged powder is prevented from getting fully into the holes and slots of the stators by the Faraday effect, this can result in thin insulation on some surfaces. The PCB material does not suffer this problem as the insulation does not have to enter the holes or slots. Our stators have 2 coats of translucent green insulation over the conductive copper layer for excellent insulation and 2 coats of black finish on the outside for good cosmetic appearance. Prior to coating the copper is etched away from the edge of the slots so the insulation encapsulates the copper. This makes the insulation much more effective than can be achieved with punched steel. To see comments regarding the new 3 transformer design click HERE. While we were at it we thought, why stop here? The addition of the second transformer made significant improvements over the original single transformer design so we experimented with a third transformer dedicated to the treble section. This combined with the friendly assistance of a couple of customers in Perth that were prepared to be guinea pigs, saw the development of the new 3 transformer drive system. Essentially each section of the Acorn panel now has its own dedicated transformer driven through a passive 3 way crossover. The individual sections can also be driven using an active crossover if desired. This has allowed total control of the frequencies sent to each section with no blurring caused by filter resistors. We also designed a circuit board that not only has the crossover components mounted on it (not the transformers, they’re too heavy) but it also has overdrive protection scaled to suit each individual section. The protection circuit is formed by each section having a series of VDR’s (voltage dependent resistors) arranged in parallel to the ESL section. When a threshold voltage is reached the VDR’s start to conduct, shunting the energy away from the panel, thereby protecting it from serious arcing. The VDR’s are out of circuit while the speaker is operating normally so have no influence on the sound quality. The new crossover board has the facility to accept input from a single amplifier, bi-amping or even tri-amping. This is configurable using board mounted jumper wires. We have also re-designed the EHT polarising supply to carry its own adjustable regulator on the same board, The output from the supply is controlled by a 25 turn trim pot that allows very fine adjustment of the bias voltage. This allows the speakers to be optimised for output and balance. Needless to say, these modifications come at a cost. However, we are confident that the improvements to the performance of the Acorn more than justify the revised cost of the kit. Acorn ESL’s in a simple but elegant aluminium frame, plans available upon request. Aluminium Enclosure Dimensions 2150 x 470 x 50mm (the width of the side cheeks). Note that the frame material and dimensions can be customised to suit your requirement. The construction manual has plans for the timber enclosure and aluminium enclosure seen above, there is also a design for a very quick and simple PVC pipe frame - I know this sounds ugly but it is covered with a grille cloth sock so you don’t see the PVC, just the base and rounded cloth covered sides! Needless to say, there’s never a free lunch. 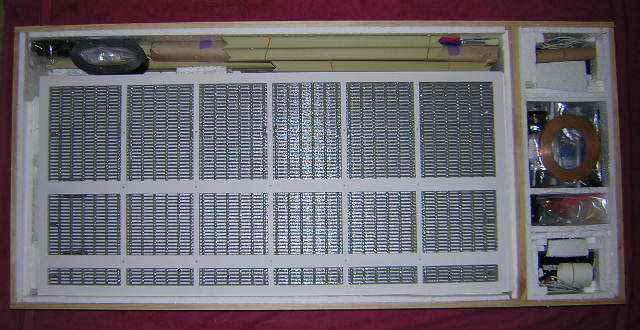 The down side is the additional cost of the PCB stators over the punched steel type.